In the hands of Duvey12. Use TB2YKM2 to reference this item. This coin’s mission is to travel from cache to cache to raise Bike Awareness all over the world; Riding/driving safely takes everyone’s cooperation and patience. It is NOT the goal of this geocoin to make as much miles as possible, neither to keep track of all geocaches you have visited. Please use your own trackable to log your tracks. Above mentioned logs will be removed. On August 12, 2008, Tod was riding a motorcycle when he was killed in an accident caused by a left turning vehicle. Tod was the third member of Team Rod & Tod w/KAboom. 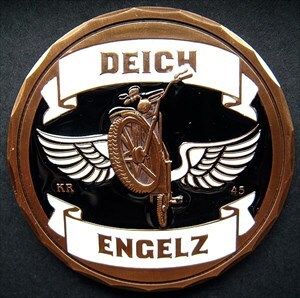 This coin is released in his memory and in memory of all motorcyclists killed on the road. The coin is part of the Bike Awareness project, started by Rockin Roddy. Speeding, inattention, inexperience, fatigue, drugs and alcohol and illegal manoeuvres are given reasons for causing accidents. YOU have the power to do something to control each of these factors. Some of the catch phrases that have been used to promote safe driving and riding: Rolling stops kill, driving and riding responsible helps save lives! Respect those around you, watch for all users of the road! Stop driving distracted, look for bikes! Bikes have every right a car does, please share the road! The other night I came home from a long drive. I had driven home but that I didn't know how I came home. I didn't notice how tired I was. I know I hadn't met any difficulty's, I know I didn't make any accidents, but I had not been alert the on the way home. Exactly the type of situation to cause an accident or to react too late or the wrong way on difficult and sudden things that can happen in traffic. Also the type of situation to miss seeing another car or biker. So here is my catching phrase: Stay alert on yourself; don’t drive when you are too tired!!!! Will be moving it to a safe active location! Will move along and drop in a nice safe cache that I know of-- my own!